Your donation will help build a "portal to the future" for library services. located at the entrance of the library. the greater Paw Paw community! Stop in the library for more information or download and print an application here. Recognize a person or commemorate an event with this special tribute. 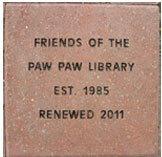 The Paw Paw District Library will purchase materials and place a book plate on the item honoring the person or event. A letter will be sent to the honored person acknowledging your generosity. 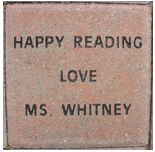 Library tributes help the community by improving the library's collection and facilities. 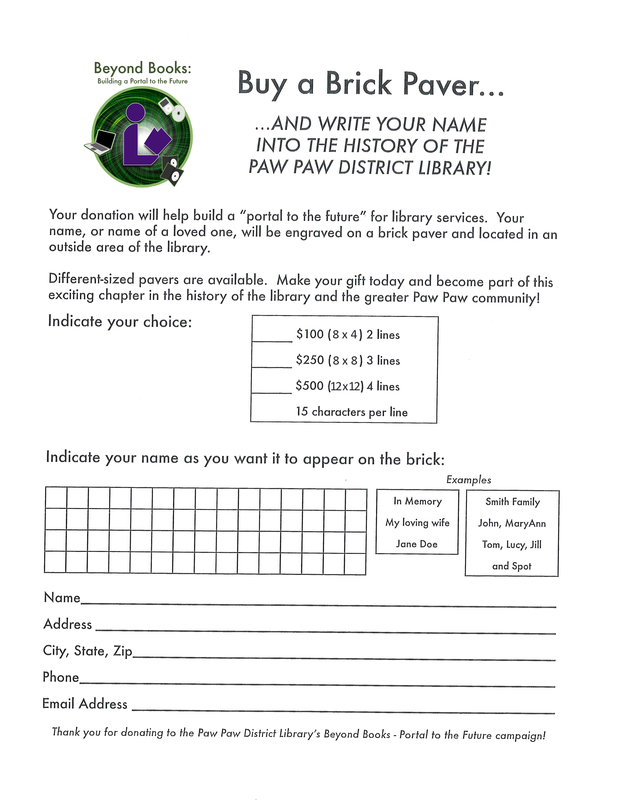 A tribute is a unique way to combine your enthusiasm for the Paw Paw District Library and recognize the person or event. Gift Tribute Request Forms can be found on the pamphlet wall in the library's lobby. The library appreciates gifts of new, high quality, or useful book or audio-visual materials. However, there may be times when material gifts cannot be accepted into the library collection due to the item already existing in the library, the condition of the item, or expected usefulness of the item. Materials the library cannot use will go on the library book sale shelf or the Friends Book Sale. Proceeds will support library programs.